With the Academy Awards coming up this Sunday, I'm sharing this post from last year. I'm pretty sure we'll be winning again this year. First, let me tell you I can't believe I've won. Honestly, it was enough just to be nominated. I'd be lying if I said I haven't thought about, dreamed about, this day. But I never really thought I'd be standing on stage before all of you accepting this award on behalf of the Loudest Family in America. Just like everyone else there are days, so many days, when I feel like yes, yes I deserve this award. We are the Loudest Family in America. And then there are days when for ten, sometimes even twenty minutes, there is silence and I think no, no we will never win the coveted prize. We just aren't loud enough. I cannot believe my three kids were able to win this award over larger, much larger, families. I want to congratulate the other nominees, I'm as surprised as you are that my three were chosen as the loudest against such truly loud families like the seven O'Leary brothers in Indianapolis, the quintuplets in Washington State and of course, the 4 sisters ages 13-17, each a year apart sharing a two-bedroom apartment with their moms in Queens. 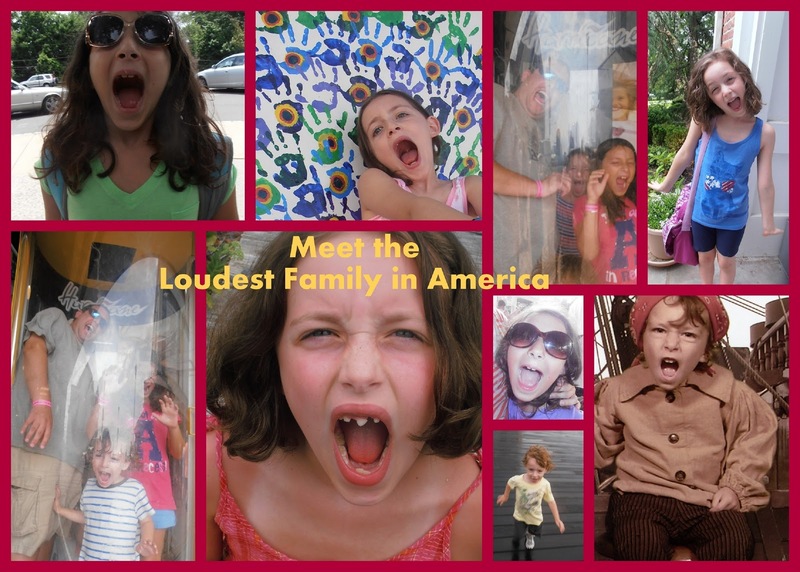 You are all amazingly loud kids, but I am just honored and thrilled, absolutely thrilled, that my kids are even louder children. It is, every mother's dream. 1. Never take a day off. Be loud every day. Mother's Day, Dad's birthday, vacations... you need to keep up the screaming. And not just the regular screaming and mayhem of kids that takes place in homes across this land, take it up a notch! Scream the bath water is way too hot, and seconds later yell it's too cold. Don't ask politely for a bath towel when you can just as easily shriek that demand at the top of your lungs. And obviously, the brisk chill when you exit the bath is the perfect reason for totally nonsensical noises at all sorts of decibels. Persistence, this is the path to victory. Every moment is a new opportunity for noise. Remember this, and never miss a chance - no moment is too small, too mundane to leave alone. And just as importantly, think outside the voice box! Your voice is not the only way to make sounds, you can be loud plenty of other ways. Add makeshift drums, play the rim of your water glass, drum your fingers on the table, it all adds to the overall noise level. That's how you win. 2. Don't let a brother or a sister steal your thunder. If your toddler brother is having a tantrum, don't wait 'til he's done to start your own screaming match with your sister. Start yours the moment he starts his. It's just basic science, more voices = more noise. THIS is how you win. And to all the tweens and teens out there? There is no time that's not the right time for you to have your own epic meltdown. Think you've outgrown irrational outbursts at all hours of the day and night? You have not. This is how you win. 3. Mom and Dad - you are part of the family too.You will not win Loudest Family in America with just the endless screeching and screaming of your children. You must be part of the melee too. My personal favorite is to scream at them to stop screaming - it's a perfect way to get them to scream much, much louder. And Dads? If you yell at the kids to quiet down, that really gets them going. This my friends, is how you win. And last, it is my pleasure to thank my family. Without you there would be no loudness, no constant noise and I would not be here today, on this stage, accepting the prestigious award of Loudest Family in America on our behalf. Thank you for being loud every day, from morning until night, without your dedication and spirit we would not be here today. And winning this award? It makes every noise-filled day all the sweeter. What award is your family must likely to win?